Grain is the creation of Paul Keatley and Ian Gibson. It started one Christmas night while they were entertaining friends. Paul told the story as Ian drew sketches to accompany hi. They took the ide and were going to package it as a series of illustrated children's books - Ian even drew up a whole pile of illustrations - but nothing became of it. 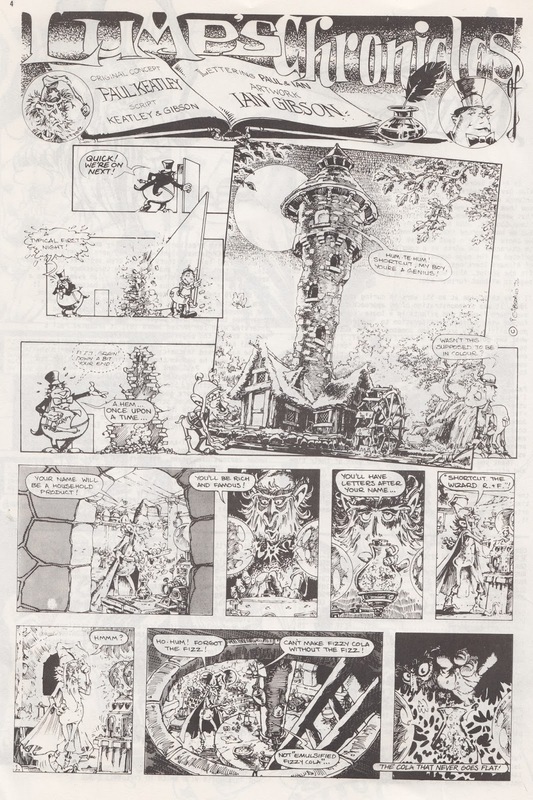 it was in 1975 that Ian decided to put Grain into comic book form, harking back to its original inspiration - Asterix - and produced 12 finished pages. When John Jackson and I unearthed the unscripted pages during the course of our interview with Ian (Arken Sword 15), it prompted Paul & Ian to script the pages for me to print. Paul Keatley is probably a name you're not familiar with, but he has worked in comics before. His break came in the early 70s when he was in London sharing digs with Ian and Steve Parkhouse. Paul sent in a lot of scripts to IPC's funny comics line - Buster, Whizzer & Chips etc. - but kept receiving rejections. Steve, who was already working for IPC, thought they were good enough so he included Paul's scripts in his batch of scripts. They were accepted. Eventually Steve told IPC the truth, and Paul sent in scripts under his own name. Paul moved on to other jobs, and other interests, including a tour of Europe as one of THE FORTUNES.